Dormer windows are often difficult to dress effectively with curtains. Shutters are therefore very well suited to dormer windows as they are custom designed, manufactured and installed to fit perfectly within the window ‘reveal’ created by the dormer window. Dormer windows are built into a sloping roof and are a little like a prism shaped box that is built into the angle of the room. The most typical design of dormer windows in the UK sees the main window running left to right, wall to wall. This can therefore make fitting curtains difficult as the curtains, when pulled open, cover a large part of the window and therefore blocks out quite a bit of light from entering the room. Dormer windows are therefore very well suited to shutters. Shutters take up very little space if you choose to have the shutters opened back (ie – if you actually choose to swing open the shutter panels which would then open to a 90 degree angle against the side wall). On this particular installation the shutters on this dormer window in a Hampshire home fill the entire space of the window. The shutters panels are hinged to open 2 shutters bi-folding to the left and 1 shutter opening to the right. This means that on one side of the dormer window there will be 2 panels. However, this ‘stack’ of shutters on the side of the dormer window is very unobtrusive. When opened back and folded onto each other the ‘thickness’ of the stack of the shutters is only around 60mm. Shutters therefore eat up much less space than curtains would on a dormer window of this nature. The shutters on this Hampshire home are finished in ivory paint, are made from yellow poplar hard wood and are designed with the Open Sky hidden push rod system. Shutterly Fabulous is one of the UK’s leading shutters companies. Selling plantation shutters not available from any other full service UK shutters company, we install shutters not only on dormer windows but on a multitude of different windows. 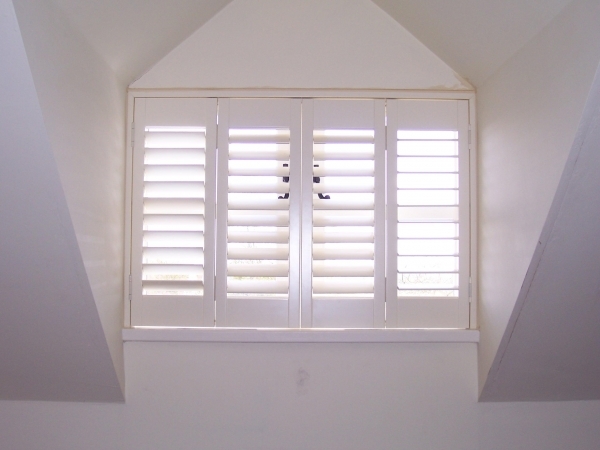 Call 0800 9 700 800 to arrange a shutters consultation.